Join the Women of Woodside on April 29th for a Low Country Boil! 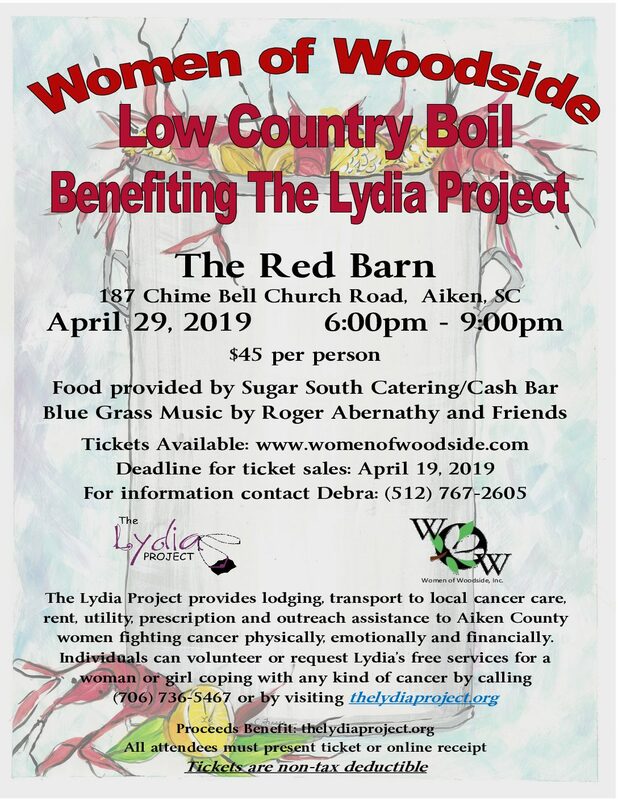 All proceeds go to benefit The Lydia Project, a nonprofit that provides lodging, transport to local cancer care, rent, utility, prescriptions and outreach to Aiken County women fighting cancer physically, emotionally, and financially. Visit The Red Barn on Chime Bell Church Rd. from 6-9 p.m. and enjoy great food and Blue Grass Music by Roger Abernathy and Friends! Tickets are $45 a person and are available at www.womenofwoodside.com. The deadline to buy a ticket is April 19th and all attendees must present the ticket or online receipt. For more information, contact Debra at (512) 767-2605.